When we think of using cans to build walls, it is very common to see them as incapable of supporting weight and to think that they will collapse once set in place...not so. 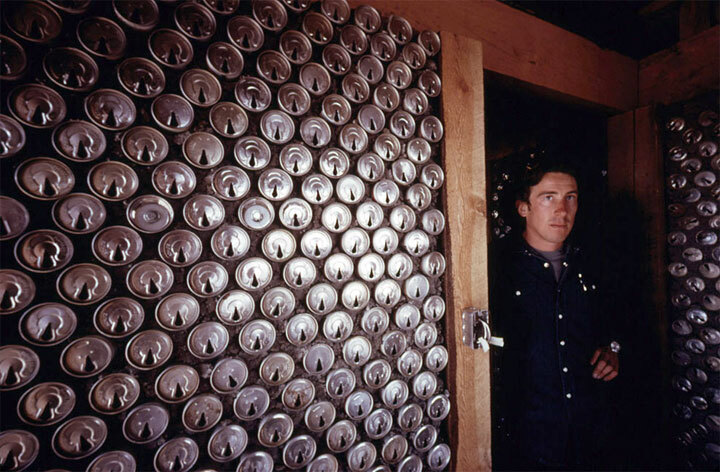 The place of cans in walls is to extend the mix, not make strong the work. Think of cans as the equivalent of the air that is in the cement blocks used to build millions of houses worldwide. The air doesn't hold up the roof, the solid part of the block does. Same goes for cans. Aluminum cans are ever present in the world today anywhere you go, to the point where they are a very significant resource for vernacular construction, more becoming available every day. Some debate the greenness of cans...aluminum requiring considerable electricity to extract from ore. This is possibly true in some cases. However, the aluminum coming from the plants in areas like Kitimat, British Columbia, where river water turns generators at hydroelectric stations, is refined by the power of rainfall, a renewable energy. The force of falling water creates the power needed to smelt the bauxite & form the aluminum metal. I like the beneficial qualities cans have and they are easy to get. A person can carry hundreds of cans at a time, lay them all day, and never get tired from their weight. They don't rust and aren't biodegradable. And the majority of cans are the same size, making lay-up go smoothly...just set those mini sodas and big boys off to the side, send them in for recycling (or maybe they get used in areas where the need is for partial cans or oversized ones). Double can walls make sense to build. 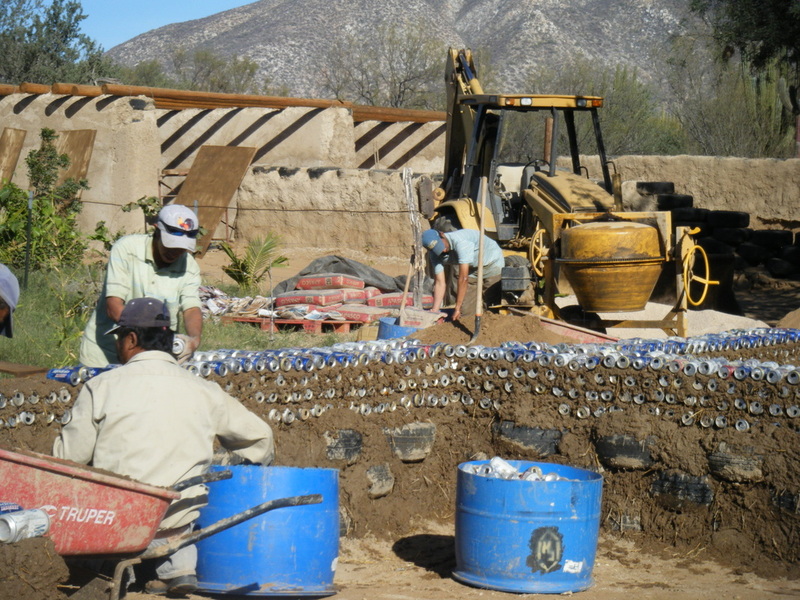 My house has walls 3 times the thickness of a 12 ounce beer can with 2 can walls laid leaving the space of 1 can empty, which later gets filled with a "padobe" (adobe mud with paper in the mix) mud mix, the same mix the cans are laid in. This gives you thermal mass from the mud and the insulating aspect of the paper.